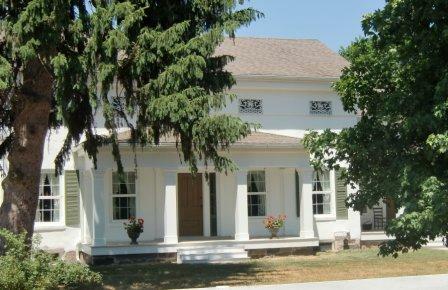 Michigan was settled right when Greek Revival Architecture was becoming popular. 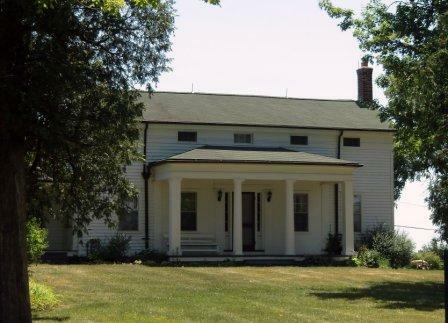 There are a lot of Greek Revival houses in Michigan. Washtenaw County takes in the city of Ann Arbor. 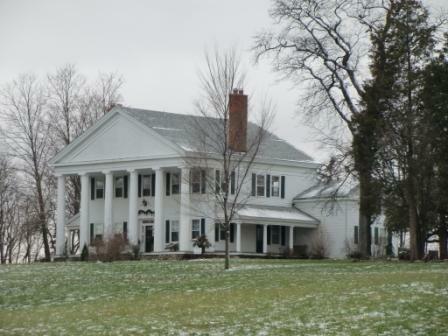 Their county government website includes several pages on Greek Revival Architecture in Washtenaw County. That website lists 28 houses. I was able to visit four of these on one trip and six on another. The county website has maps and a fair amount of history, but I have larger pictures. I hope to add more to this page during future trips to the Ann Arbor area. This is the Treadwell Hopkins house. It is just off Highway 23, Northwest of the city. It is tricky to find. The address is 4004 Ave Maria Drive (Old Earhart Road), Ann Arbor Township. Unfortunately my navi puts this a few hundred yards from the correct site. My navi puts it in the middle of the parking lot for Dominoe's Pizza headquarters facility. I nearly missed it. This 1860-ish house is now a rectory for the Christ Our King Catholic Church. The church itself hides the house from the road. The church also owns the farm buildings once associated with the house and has converted them into some kind of church facilities. I assume they are for classrooms now. The church has a very pleasant, modern look, and I must commend them on both their new architecture and the way they preserved the old Greek Revival architecture. The house is distinguished by the frieze windows. It is a little strange because the frieze itself is brick, but there is a thin line of white below the frieze, and a white cornice above, so the frieze is clearly defined. Travelling East I came to the 1860 Douglas-Nanry house. This is a hen-and-chicks arrangement, which is common in and almost unique to this area. Think of the main, tall, central portion as the Hen and she is protecting a chick on either side. Okay, its a stretch of the imagination. You can also call it a "Basilica" arrangement. In most cases the chicks are topped by two halves of a pediment. It is like someone slit a one-story front-gabled house down the middle, pushed them apart and slipped in a two-story front gabled house in between. In the case of the Douglas-Nanry house the roof over the chicks is hipped. Instead of forming an open gable the roof slopes down. It is an unusual variation to an unusual variant of the standard Greek Revival architecture. 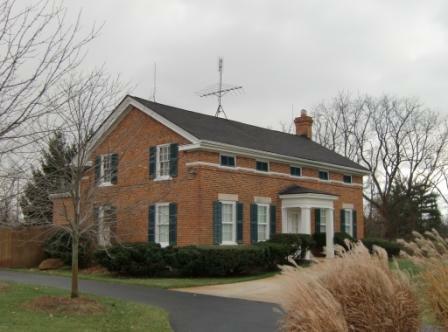 The county's website shows a house with windows. Now it is covered with plywood. However I think it was abandoned even then. I can see a chain link fence in the picture on the county's website and I think that fence was put up after it was abandoned as a way of making it off limits. It is a shame that it is left to rot. There is some development in the area, but nothing threatening. Perhaps one of my readers will rescue it. If you do, invite me up to photograph the restoration. I have attached a picture of the rear of the house, because it shows the strange way that the house was extended. Note that the one wing is extended back with an asymmetrical roof. Interesting. The central part of the house meets up with the wing (or chick) right at the peak, but when they extended it back they also made the wing a little wider resulting in this very non-Greek looking roof. It is such an interesting deviation from the standard Greek Revival Architecture. I am wondering if it was created this way, or added later. It is possible that other hen-and-chicks have this same thing. You usually only get to see the front. 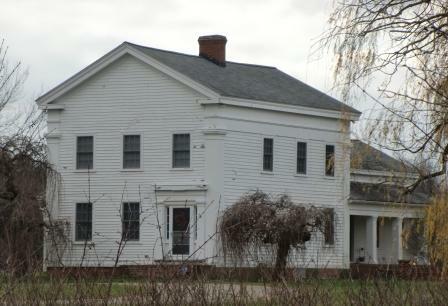 A couple of miles East of the Douglas-Nanry house is the Ezra Lay house. 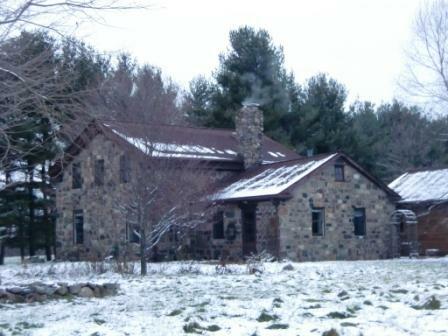 Ezra built his house Southeast of its current location, but the house was moved in 1966, to preserve it. The house was built i 1833. That was in the early days of Greek Revival architecture, whereas the other houses on this page were towards the end of the Greek period. The website says it was a blind pig for a while. I looked this up. It just means it was a speakeasy. It also was an apartment building during World War II. North of the above three houses is the Leland House. 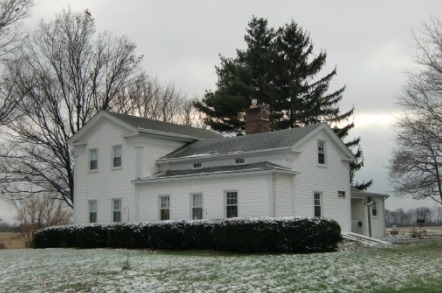 It is listed as 3850 E. North Territorial Road, Northfield Township. My Navi would only go up to 2899. As I suspected, the road changed names, but the numbering remained consistent, so I had no problems finding it. There is not much information about the house on the count website. The site suggests that it may have started out as a hen-and-chicks house, but I don't know where they get that from. The window above the porch is unusual. That three-part design is atypical for Greek Revival architecture. The house above is from a second trip focusing on the houses around Dexter, Michigan, which is East of Ann Arbor. This is Gordon Hall. It truly looks like a Greek Temple, with its broad front and six columns. 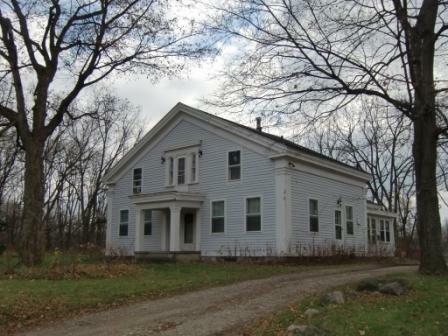 This house was built in 1841 by the founder of Dexter, a guy named Samuel Dexter. You can't tell from this angle, but it is symmetrical. The left mirrors the right. It has two wing extensions, but also two little side porches. The house below is on the same road. This also was built by Samuel Dexter, this one in 1834. 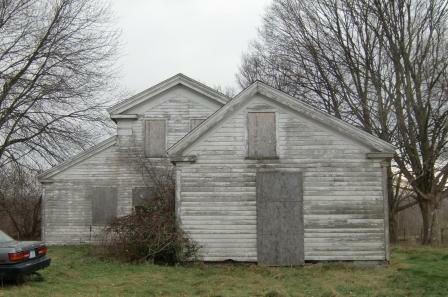 They say this is an example of an upright and double-wing house. I'd say that both these are, its just that Gordon Hall's center structure is so prominent that you don't notice the extensions, and it is a more complicated structure. There was a flyer on this house. It is for sale. It is yours for a mere $549,500. 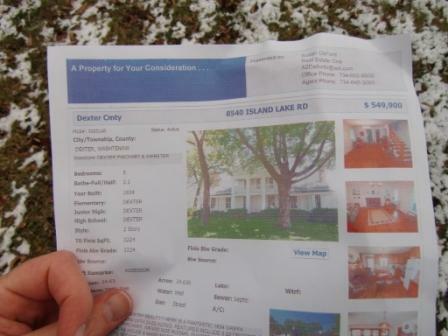 It comes with 25 acres. It also has a lot more to it than can be seen from the front. 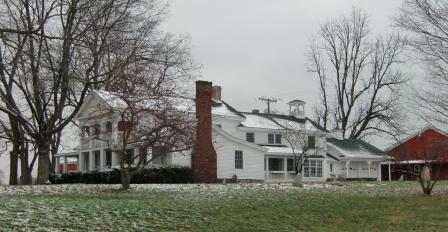 I have provided a side view that shows the extensions to the main house. The house above is the John Stanton house on Mast Road near Dexter, Michigan. It is an upright and wing, meaning it has one wing so it is not symmetrical. It was a common arrangement, and the porch on the front was also common. The porch does not look very Greek, but it was handy. 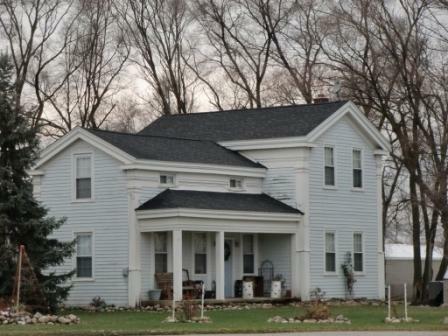 Front porches came in with the Carpenter Gothic houses and stuck around for Greek Revival architecture. 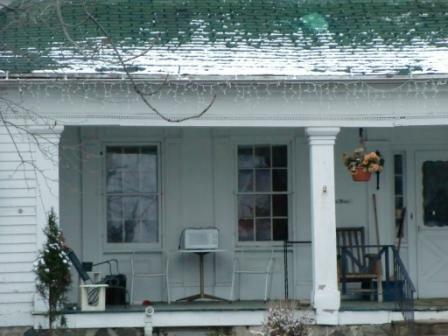 The Greek Revival houses with the big pillars in front were a natural for a porch, but it strains the style to have a porch on the wing like this. However it is very practical. It was also common, but not very Greek, to have the entablature not cross over to form the bottom of the pediment. While it would have looked more Greek, it would create a problem with the windows that just happen to be right where the entablature would need to go. You could have built with slightly taller walls and avoided this problem, but I suspect that money became a limiting factor. So we have a lot of Greek Revival houses that have a suggestion of the Greek rather than a true rendition. Note the frieze windows. It is a nice touch. Of course if this were a true entablature supporting a heavy roof those windows would be cutting right into a supporting beam. While I say that they aren't very Greek, these flaws were common with Greek Revival architecture as it was practiced for residences in the United States. Truly, none of it was very Greek in the sense that ancient Greeks did not employ pediments in their private residences and their homes were Mediterranean, with open courtyards in the middle, very different from your houses of temperate North America. Down below we have a house that is also on Mast Road, only a couple of hundred yards further down. The two houses are within sight of each other. I suspect that this was also on the built by a family member. Perhaps it was just a neighbor who really liked the John Stanton house. There is nothing in the Washtenaw County guide about this, but it has to have a good story behind it. 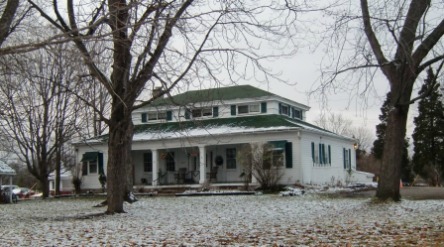 The house below the farmhouse of Luther Boyden, built in 1860. 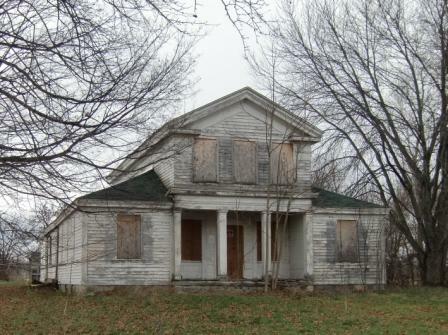 By then Italianate was in full-swing and Greek Revival architecture was dying. This is a blend. Its basic structure is Greek Revival, but it has Italianate corbels and porch columns that are definitely not Greek in inspiration. It also has a strange window spacing on the second floor. The spaces between the windows vary. 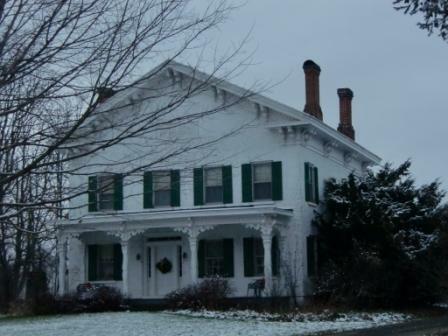 Greek Revival architecture, as with most styles, generally kept even spaces with windows. There is probably a structural reason why this was necessary. Perhaps an interior wall comes in right where the window should be. It also has this huge blank pediment. They had plenty of space to throw in a window, or some kind of pediment decoration. False windows were often employed, just to break up the massive empty space. The house has cornice returns. It could have carried an entablature across or a brought the returns across to break the open area up. As it is, the house seems to be top-heavy. The house above is the Williams-Mast house. I don't know if it can be considered Dexter, Michigan. Let us just say that it is the Ann Arbor area. It is unusual in that it is square and has a hipped roof. It is Greek in its details. It has an entablature under both roofs. At the bottom of the architrave is a line of dentil moldings. The columns are square but have a capital. The windows have columns, lentil and sill in a Greek fashion. It was built in 1828, at the very beginning of Greek Revival architecture in the United States. Perhaps that is why it doesn't follow a common format. What I like about this house is its loggia. This is the indented porch. It was a device that Palladio often used. You have a large entry way to the house that is protected from the elements and yet not truly inside the house. Below it we have the final house I visited for my Dexter trip. It is the least Greek of all these houses. 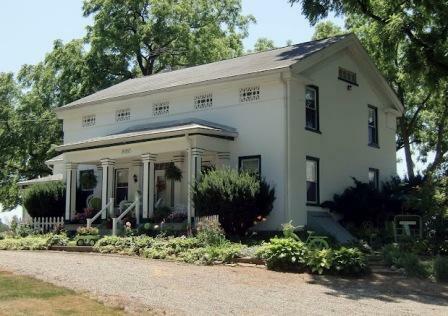 I am not sure that it should be considered Greek Revival architecture, but since it was on Washtenaw's listing for Greek Revival houses I include it. It was made with field stone. It doesn't have an entablature. At least from the outside it has little Greek detail. 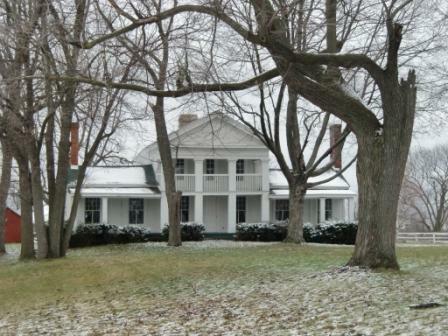 My third trip to the Ann Arbor area brought me to the little town of Saline, MI and the homes built by Stephen Mills. Stephen was a builder and mason. The home below is built with adobe and the walls are 18" thick, according to the current owner. The entablature is white-on-white, so barely visible, but the frieze windows identify where it should be. The entablature is cut off even with the cornice return to allow for full-sized windows. This seems like a more effective treatment than just cutting the windows right into the entablature. The outlining of the pillars in dark green, to match the window frames, is unique, but effective. All white houses get a little tiresome. Another Stephen Mills adobe house. This one unfortunately obscured by the trees. A final house on my third trip, the Sutherland-Wilson farm. A wood frame house. It has square columns in the corners and Doric columns for the two interior columns. Sadly I could not find a couple of other houses I was looking for. It appears that development has turned them into shopping centers.